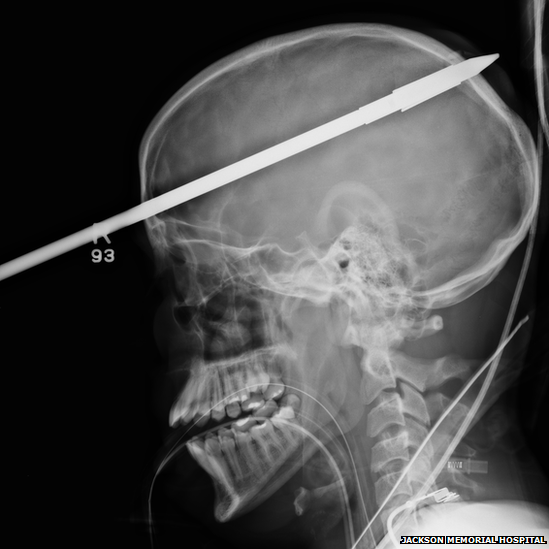 Yasser Lopez, a teenager from Florida, has miraculously survived after a spear was shot through his brain, doctors say. Yasser Lopez, 16, is recovering after he was accidentally hit with a spear gun by a friend during a Florida fishing trip this month. Medics at Jackson Memorial Hospital in Miami said the 3 ft (90 cm) projectile entered his brain over his right eye and went out the back of his head. He is now out of bed and speaking following a three-hour operation. Medics said he was awake as he arrived at hospital, and became “agitated”. After sedating the teenager, part of the stainless steel spear had to be severed with a mechanical cutter so he could fit into the CT scanner. Doctors said the teenager has no memory of the freak accident. He was shot with the projectile as he swam in a lake near his Miami area home on 8 June when his friend set off the trigger of a spear gun he was loading. While medics are not sure of the extent of the damage to his memory and other parts of the brain, they say his condition could have been much worse. “It’s a miracle the spear missed all the main blood vessels of the brain,” neurosurgeon Ross Bullock told reporters. Also helpful, doctors say, was the foreign object’s trajectory into the right side of the brain, Yasser Lopez’s non-dominant lobe, missing the parts responsible for speech and other important functions.